The British Gazette » Brexit: another fourteen days to go! 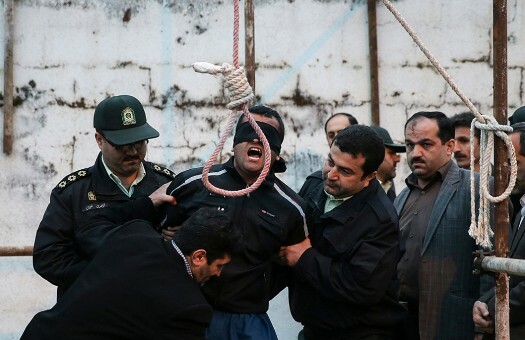 Above, a man being hanged publicly in Iran. “Depend upon it, Sir, when a man knows he is to be hanged in a fortnight, it concentrates his mind wonderfully” is one of Dr. Johnson’s most famous quotes. Yesterday, Madame Mayhem made a speech at the Tory conference in part rebutting the speech made by another Mr Johnson the day previously. We note that one of the commentators posted a link (https://www.reuters.com/article/us-britain-eu-ireland/new-british-proposal-for-irish-border-step-in-right-direction-eu-source-idUSKCN1ME0TH) to a Reuters report suggesting a new proposal from the UK. There are now 14 more days (a fortnight) from today, Thursday, 4th October 2018 to the day of the next EU Council meeting, Thursday, 18th October 2018. It is of course entirely probable that the Brexit can may be kicked further down the road for a further 28 days to another (emergency?) EU Council meeting on Thursday 15th November 2018. This begs the question: IF the Tory government cannot resolve the Irish border issue by either the Thursday, 18th October 2018 or Thursday 15th November 2018, will the EU finally call time and begin rapid preparations for a no deal Brexit?